Looking for a testosterone-filled night with the guys--or just something to do that appeals to men of all occupations? 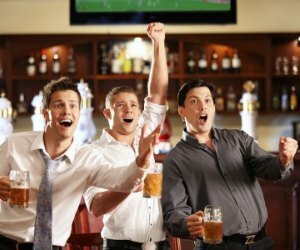 Are you in charge of planning a bachelor party and you want to keep it "clean" but lots of fun and memorable? (Hint: Most of these businesses will do something special for your party or provide a private room.) We've rounded up some manly things to do for you within a 20-minute drive of just about anywhere you live in Collin County. Just because you're a family man doesn't mean there isn't something to do with the guys. Allen, Frisco, McKinney and Plano all offer great choices for guys that do not require one iota of estrogen. This is the bowling alley that's been around for decades. It's just a little less expensive than the other bowling locations in the area. Also has five coin-op pool tables for those that consider themselves a pool shark. Said to have nine of the best Disc Golf holes in No. Texas. Bring your own discs! The disc golf course is a tournament regulation course. The course is located at Slayter Creek Park, just west of Anna Middle School. Dash's Track Disc Golf Course is an 18-hole championship style disc golf course. Bring your own disc (frisbee), of course. Two courses to suit your fancy: Alex Clark Memorial Disc Golf Course with 18 championship style holes and the Towne Lake Disc Golf Course. The latter considered by many to be one of the best courses in No. Texas. This is a real he-man thing to do together! Open Saturday and Sundays (and some holidays, like Labor Day). Hey, cowboys, why not spend some time at the shooting range together? This country club/gun range is just the place to hang out together. Unlike your typical laser tag, this is indoor war! Missions take place in combat zones such as a warehouse or office cubicle. If planning a bachelor party or you have several in your group, contact their group sales department for special pricing and missions. This is certainly NOT a "no-touch" museum; this museum's mission is to have as many video games available as possible for their guests to play! Some game tokens are included with each admission ticket. 100,000 videogame consoles, games and artifacts from the past and present. Imagine a "gunfight" of laser tag with your buddies! Or, settle for some billiards or bowling. Great fun in an environment your wife will approve. These folks insist you don't need to play golf to enjoy this game. What can enduce male-bonding more than shooting golf balls from your own bay, eating guy food, and laughing together? Tours are offered Saturdays, and what guy wouldn't want to do a brewery tour--especially when it includes beer? Unique open atmosphere in an old cotton mill with $5 beers. Open Weds-Fri evenings, Saturday 11am-10pm. So you think you still have what it takes to run that hitter to home? You and the guys can find out! Well, you may not be able to get a real celebrity pitcher to toss you some balls, but you can rent a pro batter video pitching machine! Some athletic ability is good to get through the numerous rope ladders and 39 crossings which finishes with a zip line! It'll get your group out of their comfort zone, but we're told a fear of heights shouldn't stop anyone as they can talk you through it! Winners of the Ray Miron Presidents' Cup in two recent seasons and located right in the Village of Allen. This may be high school football, but they're state champions for the past three years and in 2008. And you may have heard a little thing about their $60 million stadium. Watch website for game locations. Watching them practice when they're in Frisco is free! Professional soccer is played right here in Frisco at the Toyota Stadium! Or, catch a high school football game for only $3 (students)- $5 (adults). Take me out to the ball park...can you hear it? Evening games in the Dr. Pepper Ballpark begin in April for this AA team and run through the beginning of September. The Roughriders are a minor league affiliate of the Texas Rangers. NBA D-League connected to the Dallas Mavericks right here in Frisco! The IFL originated in Texas and has grown across the country. Get your football fix in the spring.